This badge was issued to Jatturaput Nilumprachart on 08 Mar 2018. 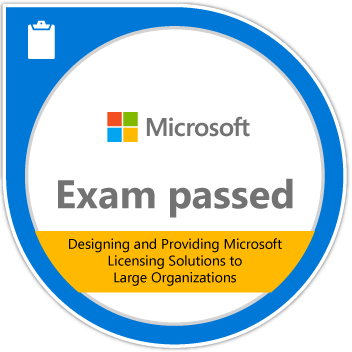 Passing this exam validates the skills and knowledge required to define licensing solutions for large organizations with 250 or more devices or users. Earners have at least six months of experience selling Microsoft licensing solutions as well as a basic understanding of all Microsoft corporate licensing solutions, including Enterprise Agreement, Enterprise Subscription Agreement, Cloud Solution Provider (CSP), MPSA, OEM, Open and Open Value.